There's nothing quite like a bracing walk along the prom or a stroll out to sea on the Brighton Pier to clear heads and revive appetites! On a wild and wintry day it's an exhilarating experience. If you'd rather ride, take the Volk's Electric Railway, England's oldest, along Madeira Drive to Brighton Marina, admiring the fine Regency terraces as you go. Experience all the thrills of traditional and modern rides on the pier - there's a wonderful atmosphere at dusk when the sun goes down and the lights come on. If you have time to spare why no try downloading a 360 degree panoramic image of Brighton Seafront. You can pan around, zoom in and out and do lots of other stuff. You must have the Quicktime plugin and some patience as it is is 368k. We think it's worth it! The surround video is made by cutting edge Brighton company Synchromedia. Strolling along from the Brighton Pier towards Hove, you'll find the Artists' Quarter where you can buy individual, one-off pieces from prints and paintings to driftwood mirrors and wrought iron beds - perfect for special gifts. Further along is the Fishing Museum, with a full size Sussex fishing boat and rare archive film of bathers at the turn of the century. There are stylish cafes, bars and restaurants where you can relax and enjoy the view. There are all kinds of watersports to try and you can hire in-line skates (plus essential knee pads) to rollerblade along the esplanade, or play petanque (like boules) on the piste next to Alfresco's. 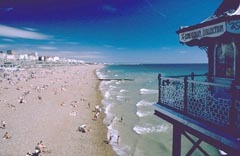 And Hove's wide, elegant esplanade and peaceful lawns are perfect for strolling, picnicking, kite-flying and playing. So whether you're looking for recreation, razzle dazzle or rest and relaxation, the seafront is the place to be. The SeaLife Centre lot's of fish and other marine life! Seabreeze3 Charter Fishing - One of the most po to championing sustainable coasts and seas. Aquavitesse - specialises in fishing over the wrecks in mid channel using the most up to date technology to enhance the possibility of good catches. Brighton Charter Fishing - offers a variety of wreck and ground fishing trips for groups booking the boat and also for individual anglers on selected days.